Why Texas Democrats should take this one seriously. Texas State Senator Wendy Davis, who electrified her state and the nation with last week’s thirteen-hour filibuster to block a sweeping assault on reproductive rights, and who promises to keep up the fight this week as the legislature is called into special session, is suddenly the most interesting prospective gubernatorial candidate in the nation. As a matter of fact, it does add up. The woman who so shook Perry that he started taking personal shots at her has the necessary name recognition, thousands of enthusiastic supporters and the potential to raise significant campaign cash from small donors across Texas and nationwide. Davis is fighting Perry again this week, celebrating the determination of Texas pro-choice activists and declaring to a huge crowd in front of state Capitol Monday that their courage and commitment had made her "believe in Texas more than ever!" Decrying not just assaults on the rights of women but on public education and public services, Davis pulled the threads of resistance together into a broad call for a fairer and more just Texas, telling the crowd: "That's what we're fighting for." Indeed, she declared, if Perry wants a special session, then she and "responsible" legislators will use it to promote pay equity for women. "Let's remind Governor Perry that fairness is and always will be a fundamental Texas value," announced the Democratic senator to a crowd that chanted "Wendy! Wendy! Wendy!" Davis shouted above the cheers: "Texans deserve someone who will stand up for them and their values." There are certainly other Democrats who could seek the governorship in 2014, including well-regarded prospects such as Mayor Julián Castro and his brother, Congressman Joaquín Castro. But, on Monday in Austin, there was a good deal of talk about how Davis might be the right woman at the right time. If Davis decides to run, she will not be the first brave, bold woman to seek the governorship of Texas. Before Richards, there was the remarkable Frances “Sissy” Farenthold, who was the only woman in the Texas House of Representatives at the same time that Barbara Jordan was the only women in the Texas Senate. Farenthold made a pair of remarkable bids for the Democratic nomination for governor in the early 1970s. She was such an inspiring figure that her surprise nomination for vice president at the 1972 Democratic National Convention drew more than 400 votes. And, of course, Miriam Amanda Wallace “Ma” Ferguson was elected to one term as governor of Texas in the 1920s, and to another in the 1930s. Texas actually has a better track record of seriously considering and frequently electing women governors, senators and statewide office holders than many American states. Yet the Texas Democratic Party has not always shined in its selection of contenders for the gubernatorial post it last won in 1990. Placing Davis at the top of its 2014 ticket could well reap benefits for the party. That’s not to say that Davis would have an easy time of it. Mounting a challenge to Perry, the failed 2012 Republican presidential candidate who makes no secret of his interest in the 2016 race, would be an uphill run in a state that gave Republican Mitt Romney 57 percent of the vote in 2012. But smart politics is not merely about crunching numbers from past contests. Smart politics takes into account personal and situational intangibles, with an eye toward mounting a campaign that takes the great leap forward. The intangible for Wendy Davis is that she has already proven herself to a substantial number of Texas voters, especially but certainly not exclusively women. Davis has never lost an election, winning three terms on the Fort Worth City Council before she beat a Republican incumbent to win a state Senate seat in 2008 and retained that seat in 2012. Davis is not a milquetoast mandarin. She’s a quick-witted political natural who clearly knows the issues and who is ready to wage fights—including filibusters—on behalf of a socially and economically progressive agenda. It is not unreasonable to suggest that Davis could build a statewide movement that would include women, African-Americans, Asians and Latinos—as well as trade unionists—in a coalition that could speed up the process of transformation that most political analysts say will change Texas voting patterns sometime in the reasonably near future. Demographics are destiny in American politics. And the demographics of the Lone Star state are trending toward the Democrats. But there’s always been a question about whether 2014, 2016, 2018—or some more distant year—will see Texas reach the tipping point. Political strategists in both parties know that one of the best ways to speed up the process is with a dynamic candidate who has the potential to raise enough campaign cash to give Rick Perry—a particularly prodigious fund-raiser—a run for his money. When the Democratic Party picks safe and predictable candidates in red states like Texas, it gets a safe and predictable result: defeat. Wendy Davis is not safe and predictable. She’s energetic and engaged, Harvard-Law-School smart and broadly experienced at the local and state levels of government. Rick Perry knows that adds up to a serious challenge. That’s why he is on the attack. That’s also why Davis could well turn out to be the most viable Texas Democratic gubernatorial prospect since Ann Richards won the job back in 1990. 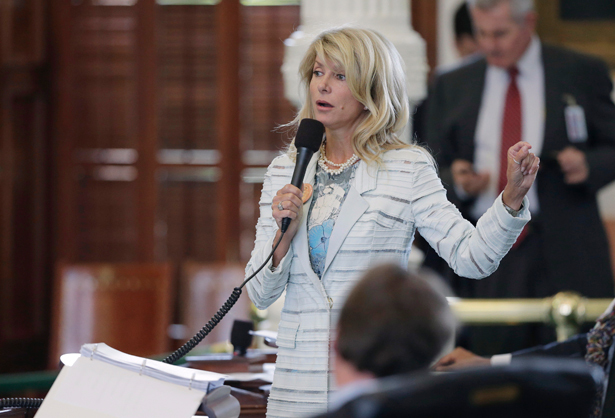 Was Wendy Davis’s filibuster heroic? Katha Pollitt argues that the state senator is not merely a hero but a superhero.